11 Night-Time Habits Every Bride-To-Be Should STOP Right Now! What if we told you that watching your favourite shows on Netflix at 3 am is probably why you’ve got baggy eyes. Well, we’re all guilty of doing just that, but we want you to look your best on the big day. So get ready to get closer to those wedding goals and kick some bad habits. It’s time to give up these night-time habits dear bride-to-be. Don’t fret, it’ll be totally worth it when you look stunning on D-Day! An hour before you go to bed, turn that little gadget off (or keep it on silent). The strain on the eyes leads to tired looking faces and dark circles. Plus a little peace of mind before bedtime and a good night’s sleep is always a win-win in our book! We get it, you’ve got to have your phone on at ALL times before the wedding. But trust us, giving yourself some space from your phone at night will do wonders to your overall appearance. This is a big no-no regardless of whether there is a wedding or not. Skin needs to breathe. Period. Sleeping with makeup on can cause wrinkles, damage pores, dry out your skin, cause breakouts and dullness. Think of that the next time you feel too lazy to take your face off! It’s annoying to have your hair on your face while sleeping, but tying your hair up at night causes breakage and weakening of strands. We suggest wrapping unruly or long hair in a silk hair scarf and if you really need to, then use a very-very loose hair tie. A loose plait also works well. Many brides suddenly decide to switch-up their night creams, with the promise of better results and that infamous glow. However, if you have a cream that works for you, then stick to it. Changing it up in the last month (or week) could cause your skin to react in a way that won’t make you happy. 5. Hydration is the name of the game! That bottle of water on your side table should be considered your magic elixir – which it is! Water flushes out toxins and keeps your skin looking healthy. During the day it might be a little hectic to keep hydrating, but on your way to bed remember to carry a bottle of water. Just like our phone addiction, that ‘just-one-more-episode’ attitude could be the reason why your eyes are puffy and baggy. A month before the wedding quit your nightly binge and instead get some rest. You’ll thank us later. Yes, you look better when you’re well rested, but that’s not all, some studies show that a lack of sleep leads to an imbalance in hormones that regulate the look and health of your skin. 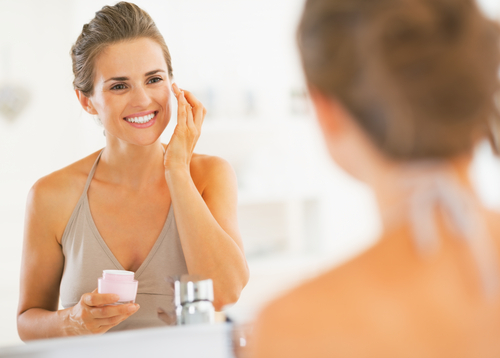 The all important ‘growth hormone’ can decrease if you don’t get enough sleep, and that ladies can lead to dehydrated skin and more pronounced wrinkles. So listen to your mama - go to bed early! Even if you sleep super late but get your 8 hours, it won’t be as effective as sleeping early for as many hours. 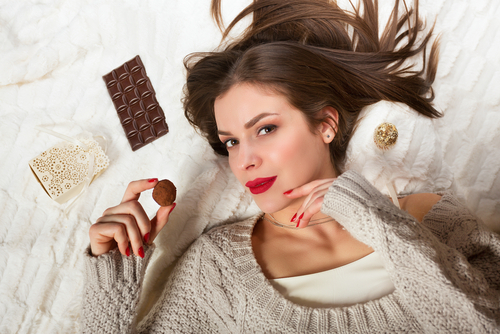 We’re all guilty of midnight cravings, but those bedtime snacks could be causing your skin to break out. In general stay away from oily, salty, preservative-filled or sugary snacks post sunset. Think fresh fruits and veggies if you’re a snack fiend and need some munchies. Did we strike a nerve with this one? Yes we know planning a wedding is stressful, but smoking robs your skin of oxygen, makes it dry and causes discoloration. If you can’t kick the habit altogether, try to at least cut down or give up that EOD smoke. 10. Do away with cotton pillows! Everyone from Kim Kardashian to our favourite gossip girl, all sleep on silk. Apparently, the smooth fabric is said to reduce frizz in your hair and doesn’t leave those horrid sleep-marks on your face when you’re dead asleep. Also, in hot months the fabric remains cool, which is always a plus. We’re all for better looking hair and skin the morning, so why not give this a go!? In our opinion that bridal glow comes from being truly excited and happy about your wedding. As the saying goes ‘happy girls are beautiful girls’ and we couldn’t agree more with that. Whether you give up or adopt different habits, it’s vital to enjoy the whole process of your wedding. So take a deep breath and smile, gorgeous!